"Cucumber and avocado sushi! These rolls are easy to make and you can add either fake crab or smoked salmon. 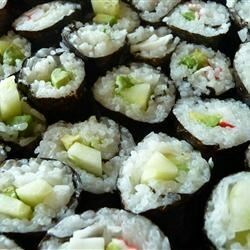 Serve with teriyaki or soy sauce and wasabi!" YUM!!! I made this for my friends and it was a big hit! Served w/ Soy and Teriaki Sauces. Recipe is so easy and quick, even my 10 yr old sister made it by herself.